The tomato is an essential ingredient of the Mexican salsas. 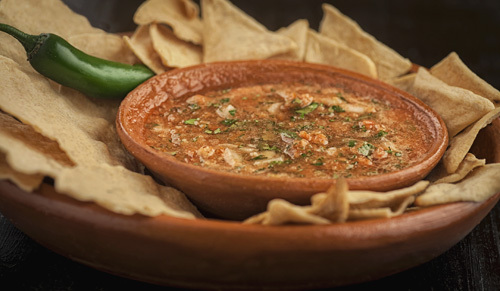 In this occasion the tomato is the protagonist and is mixed with serrano peppers and other ingredients to achieve a salsa that is fresh, spicy and with slight sweet notes . The tomato and serrano pepper salsa is perfect to accompany a tasty shredded beef , some chorizo and potato tostadas or some tacos al carbon – or simply put it on the table and you will see how is used in many dishes. In this preparation you are going to cut, roast and blend – you won’t have any complication. This salsa is moderately spicy, if you want to reduce the hotness just use 2 serrano peppers. Use fresh coriander in the recipe because it gives more flavor than in its dried version. The recipe is given for 2 cups. Roast the serrano peppers for about 2 minutes and the tomatoes for about 5 minutes, until all their sides are moderately roasted; move them regularly with some tongs. The ingredients are roasted so the salsa has more flavor. Finely chop 1/4 of an onion and 2 coriander sprigs. Upon completion put them in a bowl. Pour in the bowl the mixture that was blended and mix very well the tomato and serrano pepper salsa with a mixing spatula. Tip: Hurry up to finish the salsa because in 1 day it will lose the tomatoes freshness. Variation: Did you already try the Mexican style tomato salsa ? These tomatoes are fresh and juicy, just the ones that are needed for this recipe. In this recipe some good tongs are needed.